Swords Fencing Club was formed in April 2012 to offer coaching in the Olympic sport of fencing, concentrating mainly on the epee and sabre weapons. The club meet on Thursday evenings 8pm-10pm at Bebington Civic Centre Wirral. We start the evening off with a warm up followed by group footwork. The second part of the evening is for free fencing and coaching sessions (group or individual). All are welcome to the club, from complete beginner to competitive fencers. Our youngest fencers are 12 years old and we have no upper age limit! Beginners courses are held throughout the year. Our new fencers will be taught basic footwork before moving on to an introduction to the epee and sabre weapons. Please see our beginners page for more information and details of up coming courses. Some of our members are competitive, and have achieved success in national competitions, others enjoy the social aspects of the club. We frequently hold social nights, previous events have including 10 pin bowling and casino. If you have any questions or queries, please don't hesitate to speak to any member. 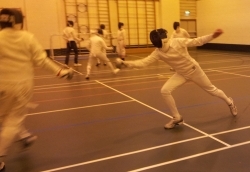 If you have any questions about the club or fencing in general, please get in touch! 1) You are responsible for your own property/kit. 3) If you leave early, check that you have your own property with you. 4) Try to leave a reasonable distance between your, and other people's kit. 5) Leave expensive items at home where possible. 6) Place phones, watches, jewellery etc. in a zipped/fastened pocket. 7) We do not recommend fencing whilst wearing an expensive watch/jewellery (see #6). 8) If an article you own does go missing, please do not panic, it will generally turn up again. When your child is fencing, parents/spectators are not permitted to 'coach' (i.e. shout out instructions etc.) from the sidelines. Taking video for later 'analysis' is equally discouraged. This is not only confusing for the child but SFC firmly believe that this can adversely affect the development of the child as a fencer. A young fencer must feel free to be able to fail without adverse consequences. In that way the child will learn and eventually become successful. Fencing should be viewed as a positive, not a negative, activity. It should become a sport which can last a lifetime and not become a source of stress for the young fencer. SFC does strongly support the encouragement of children before and after fencing but not to burden the child with expectations. Let the child focus on fencing rather than approval by the parent/spectator. Our coach has choreographed fight scenes for film and stage. Swords Fencing Club members took part in the fencing scene in the recent Red Union Films production of 'The Violators'. He has also choreographed the fencing scenes in a stage production of 'The Scarlet Pimpernel' and advised on several other productions. Stage combat sword fight duel Scarlet Pimpernel,- rehearsal.